Class that defines the Pioneer mobile robot simulator equipped with a static camera. It intends to simulate the mobile robot described in vpPioneer class. This robot has 2 dof: , the translational and rotational velocities that are applied at point E.
Definition at line 103 of file vpSimulatorPioneer.h. Definition at line 56 of file vpSimulatorPioneer.cpp. References vpRobot::areJointLimitsAvailable, vpUnicycle::cMe_, vpRobot::eJeAvailable, vpRobot::fJeAvailable, vpHomogeneousMatrix::inverse(), vpRobot::nDof, vpRobot::qmax, vpRobot::qmin, theta_, wMc_, wMe_, xm_, and ym_. Definition at line 85 of file vpSimulatorPioneer.cpp. Referenced by vpRobotPioneer::get_eJe(), get_eJe(), and vpSimulatorPioneerPan::get_eJe(). Get the robot jacobian expressed in the end-effector frame. The jacobian expression is given in vpPioneer class. _eJe : A 6 by 2 matrix representing the robot jacobian expressed in the end-effector frame. Definition at line 94 of file vpSimulatorPioneer.cpp. Referenced by vpSimulatorAfma6::computeArticularVelocity(), vpSimulatorViper850::computeArticularVelocity(), vpSimulatorAfma6::findHighestPositioningSpeed(), vpSimulatorViper850::findHighestPositioningSpeed(), vpSimulatorAfma6::setPosition(), vpSimulatorCamera::setVelocity(), vpRobotCamera::setVelocity(), setVelocity(), vpRobotPioneer::setVelocity(), vpSimulatorPioneerPan::setVelocity(), vpSimulatorAfma6::setVelocity(), vpSimulatorViper850::setVelocity(), vpRobotAfma4::setVelocity(), vpRobotAfma6::setVelocity(), vpRobotFranka::setVelocity(), vpRobotViper650::setVelocity(), and vpRobotViper850::setVelocity(). Referenced by vpSimulatorAfma6::setPosition(), vpSimulatorCamera::setVelocity(), vpRobotCamera::setVelocity(), setVelocity(), vpRobotPioneer::setVelocity(), vpSimulatorPioneerPan::setVelocity(), vpSimulatorAfma6::setVelocity(), vpRobotAfma4::setVelocity(), vpSimulatorViper850::setVelocity(), vpRobotAfma6::setVelocity(), vpRobotFranka::setVelocity(), vpRobotViper650::setVelocity(), and vpRobotViper850::setVelocity(). Definition at line 170 of file vpSimulatorPioneer.cpp. Definition at line 191 of file vpSimulatorPioneer.cpp. Referenced by vpRobotBiclops::getPosition(), vpRobotBiclops::getVelocity(), vpRobotPtu46::setPosition(), vpSimulatorCamera::setPosition(), vpRobotCamera::setPosition(), vpRobotBiclops::setPosition(), vpSimulatorAfma6::setPosition(), vpRobotAfma4::setPosition(), vpSimulatorViper850::setPosition(), vpRobotAfma6::setPosition(), vpRobotFranka::setPosition(), vpRobotViper650::setPosition(), vpRobotViper850::setPosition(), vpRobotPtu46::setRobotState(), vpRobotBiclops::setRobotState(), vpSimulatorAfma6::setRobotState(), vpRobotAfma4::setRobotState(), vpSimulatorViper850::setRobotState(), vpRobotAfma6::setRobotState(), vpRobotFranka::setRobotState(), vpRobotViper650::setRobotState(), vpRobotViper850::setRobotState(), vpRobotPtu46::setVelocity(), vpSimulatorCamera::setVelocity(), vpRobotCamera::setVelocity(), setVelocity(), vpSimulatorPioneerPan::setVelocity(), vpRobotBiclops::setVelocity(), vpSimulatorAfma6::setVelocity(), vpRobotAfma4::setVelocity(), vpSimulatorViper850::setVelocity(), vpRobotAfma6::setVelocity(), vpRobotFranka::setVelocity(), vpRobotViper650::setVelocity(), vpRobotViper850::setVelocity(), vpSimulatorAfma6::stopMotion(), vpSimulatorViper850::stopMotion(), vpRobotFranka::stopMotion(), vpRobotViper650::stopMotion(), and vpRobotViper850::stopMotion(). Referenced by vpSimulatorCamera::setVelocity(), vpRobotCamera::setVelocity(), setVelocity(), vpRobotPioneer::setVelocity(), vpSimulatorPioneerPan::setVelocity(), vpRobotAfma4::setVelocity(), vpRobotAfma6::setVelocity(), vpRobotFranka::setVelocity(), vpRobotViper650::setVelocity(), and vpRobotViper850::setVelocity(). Referenced by vpSimulatorAfma6::init(), vpSimulatorViper850::init(), vpSimulatorCamera::setVelocity(), setVelocity(), vpSimulatorPioneerPan::setVelocity(), vpSimulatorAfma6::setVelocity(), and vpSimulatorViper850::setVelocity(). Referenced by vpRobotViper650::getControlMode(), vpRobotViper850::getControlMode(), vpRobotFranka::getHandler(), vpSimulatorCamera::setPosition(), vpRobotCamera::setPosition(), vpSimulatorAfma6::setPositioningVelocity(), vpSimulatorViper850::setPositioningVelocity(), vpRobotPtu46::setRobotState(), vpRobotBiclops::setRobotState(), vpSimulatorAfma6::setRobotState(), vpRobotAfma4::setRobotState(), vpSimulatorViper850::setRobotState(), vpRobotAfma6::setRobotState(), vpRobotFranka::setRobotState(), vpRobotViper650::setRobotState(), vpRobotViper850::setRobotState(), vpSimulatorCamera::setVelocity(), vpRobotCamera::setVelocity(), setVelocity(), vpSimulatorPioneerPan::setVelocity(), vpSimulatorAfma6::stopMotion(), and vpSimulatorViper850::stopMotion(). 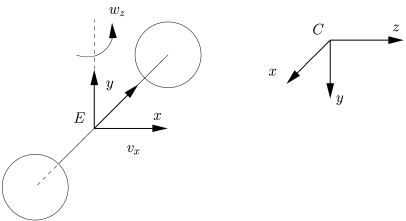 v : Velocity vector to apply to the robot, where is the linear translational velocity in m/s and is the rotational velocity in rad/s arround the vertical axis. Definition at line 113 of file vpSimulatorPioneer.cpp. References vpRobot::ARTICULAR_FRAME, vpHomogeneousMatrix::buildFrom(), vpRobot::CAMERA_FRAME, vpUnicycle::cMe_, vpRobotSimulator::delta_t_, vpException::dimensionError, vpRobot::END_EFFECTOR_FRAME, vpRobot::getMaxRotationVelocity(), vpRobot::getMaxTranslationVelocity(), vpRobot::getRobotState(), vpHomogeneousMatrix::inverse(), vpRobot::MIXT_FRAME, vpRobot::REFERENCE_FRAME, vpRobot::saturateVelocities(), vpRobot::setRobotFrame(), vpRobot::setRobotState(), vpArray2D< Type >::size(), vpRobot::STATE_VELOCITY_CONTROL, theta_, vpERROR_TRACE, wMc_, wMe_, vpRobotException::wrongStateError, xm_, and ym_. Referenced by vpRobot::operator=(), vpRobotCamera::vpRobotCamera(), vpSimulatorCamera::vpSimulatorCamera(), vpSimulatorPioneer(), and vpSimulatorPioneerPan::vpSimulatorPioneerPan(). Referenced by setVelocity(), vpSimulatorPioneerPan::setVelocity(), vpSimulatorPioneer(), and vpSimulatorPioneerPan::vpSimulatorPioneerPan(). Referenced by vpSimulatorCamera::setVelocity(), vpRobotCamera::setVelocity(), setVelocity(), and vpSimulatorPioneerPan::setVelocity(). Referenced by vpRobot::operator=(), vpRobotCamera::vpRobotCamera(), vpRobotFranka::vpRobotFranka(), vpSimulatorCamera::vpSimulatorCamera(), vpSimulatorPioneer(), and vpSimulatorPioneerPan::vpSimulatorPioneerPan(). Referenced by vpRobot::operator=(), vpRobotCamera::vpRobotCamera(), vpSimulatorCamera::vpSimulatorCamera(), vpSimulatorPioneer(), vpSimulatorPioneerPan::vpSimulatorPioneerPan(), and vpRobot::~vpRobot(). Definition at line 116 of file vpSimulatorPioneer.h. Referenced by setVelocity(), and vpSimulatorPioneer(). Definition at line 108 of file vpSimulatorPioneer.h. Referenced by getPosition(), setVelocity(), and vpSimulatorPioneer(). Definition at line 111 of file vpSimulatorPioneer.h. Definition at line 114 of file vpSimulatorPioneer.h. Definition at line 115 of file vpSimulatorPioneer.h.